Hey there Martin from NZ. Planning a summer trip to the UK in 2019 and it seems rude not to go to a scooter event...so thinking the Isle of Wight might be a stellar idea..what do i need to know in terms of accomodation in Ryde, getting there, things to do, costs just anything you think i should know. Might be a bit late for B&Bs. Maybe air B&B might have something. Tents are cheap and a ticket for Smallbrook is £26 and includes camping and all the events. Ferries are frequent, surprisingly expensive and they do their best to get you and your scooter on board. If you just want to take part in the ride out, it's on Sunday. Plenty of people get a day trip across for the ride out only. It ends at Smallbrook which is free and plenty of scoots, stalls music and people. Definitely worth a trip. There are scoters everywhere, and the locals are astonishingly friendly and helpful. If the weathers good, it's a blast. This is for 2019 not this year...though looking at booking.com, lots already booked out! We won't have scooter, maybe a rental car I'm picking...or should we forget that and just use public transport? Ah, didn't notice the year, I thought it was a last minute decision! The ferry is even more expensive by car. The ride out is a big part of the weekend, so you want to take part in that if you can. 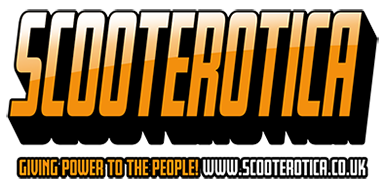 See about renting a scooter for the weekend, or see if there's a scooter dealer that will hire you one. I wouldn't get too hung up on the model - The IOW rally is a unique scooter rally, and just about any scooter will be OK. A lot of different people go for a lot of different reasons, but I think you'd regret being in a car. Plus, getting around the island on two wheels is a blast and you don't have to worry about parking. A quick google found a place that rents out scooters in Essex. You could fly into Gatwick, get to Essex to get the scooter, ride down to the IOW, then ride back to Essex via Mersea Island Scooter Rally which is the weekend after the IOW. Two rallies in 10 days!